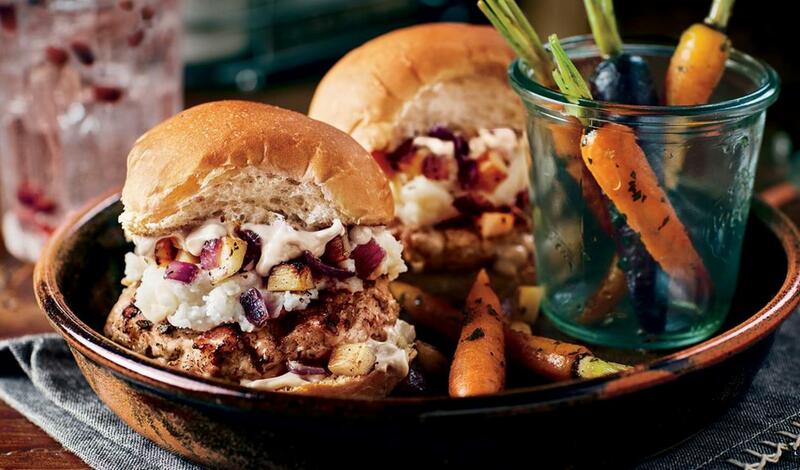 Ground turkey sliders served on classic dinner rolls with a brown gravy mayo, and topped with creamy mashed potatoes and an herb-roasted parsnip and onion medley. Powdered brown gravy mix 1 T.
Combine all ingredients and whisk until well combined. Hold refrigerated until service. Sauté the parsnip and red onion with herbs and season to taste. Hold hot for service. Mix all ingredients until combined and form into 10 patties. Chill until service. To assemble, spread 1 T. Brown Gravy Mayo on each side of the roll. Grill turkey burger to a minimum internal temperature of 165°F. Build burger with ¼ cup mashed potatoes and ¼ cup Blistered Vegetables.